Today let's talk about Paal Vazhakka - a Malabar dessert. It is such an easy and tasty dessert to make. The use of ripe plantains or nenthra pazham brings a distinct flavor. 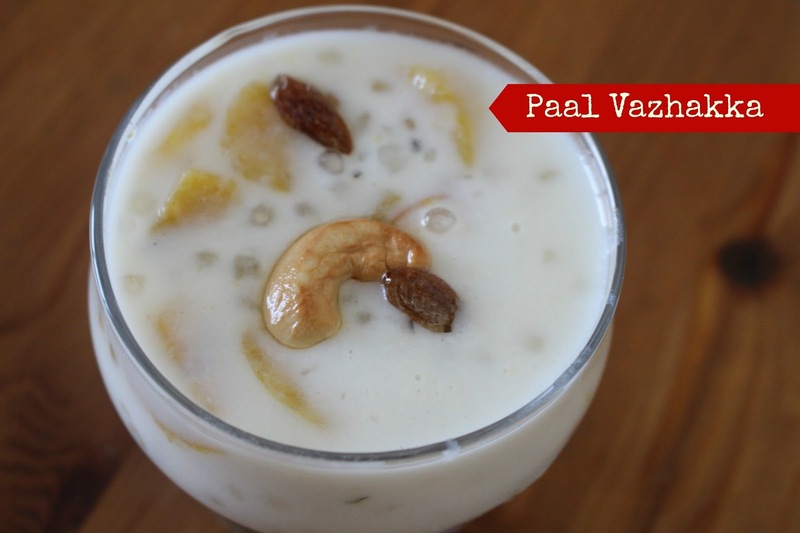 The sago blends with ripe plantains and milk to give a medium thick consistency. If you love Malabar food, you gotta try this dessert from Malabar. Ripe plantain / nenthra pazham / Kerala banana – 2 nos. Peel and cut banana into pieces. Set this aside. Slit cashews lengthwise. Set aside. Wash sago and keep aside. I have used pearl sago. If you are using other varieties of sago, please soak them for 3 hrs. In a pan, add milk and water. Bring milk to a boil. When it comes to a boil, add sago. Cook till sago is done. When sago is cooked, add banana. Stir well. Add sugar. Stir well. Check if banana is done. If not, proceed to cook for a little more time. When banana is cooked and the liquid is thickened, add cardamom powder. Don’t allow the milk to thicken too much as sago pearls are starchy and turn thicker too fast. When the dessert is cooked, switch off the flame. Heat ghee in a pan. Fry cashews and raisins. Add to the above dessert. Stir well. 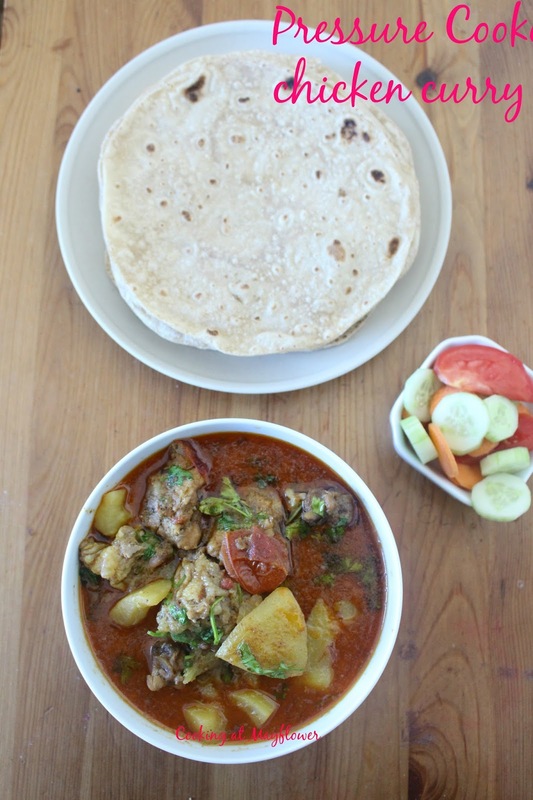 Pressure cooker chicken curry is an easy and quick curry recipe. 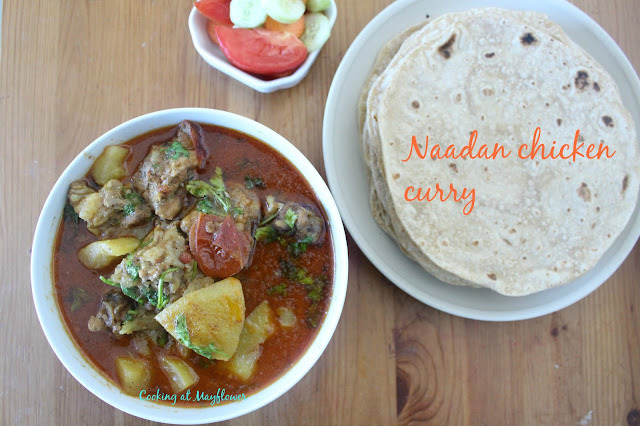 This chicken curry is apt when you have unexpected guests, for office goers, and bachelors with little time to cook. It's an excellent recipe, which can be done under 25 minutes. This chicken and potato curry serves 4-5 people. The addition of coconut milk makes this curry more tasty. This curry goes particularly well with chapathis. Heat oil in a pressure cooker. Add onion, green chilli, ginger, garlic, and curry leaves. Saute well. When the onion starts to turn color and little bit soft, lower the heat, then add coriander powder, chilli powder, turmeric powder, pepper powder, and garam masala powder. Saute for 2 minutes. When the raw smell of masala leaves, add tomatoes and mix well. When the tomatoes are little bit cooked, add chicken pieces. Saute for 2-3 minutes. When the masala is coated well on the chicken pieces, add potato. Mix well. Now add salt. Mix well. To this add water. You can add water depending on how thick or thin gravy consistency you need for the curry. Close the lid of the pressure cooker. Place the cooker on stovetop. Cook until 2 whistles or until it is done. Switch off the stove. Let the pressure cooker sit undisturbed. Allow it to release the pressure on its own. Open the pressure cooker. Now place the pressure cooker back on stove to thicken the gravy. When the gravy is slightly thick, add thick coconut milk. When it comes to a boil, add coriander leaves. Switch off the stove. Enjoy with rice, chapathi, puttu, or appam. Malai mushroom matar is a combination of mushroom and green peas cooked in masala mellowed by the addition of fresh cream. 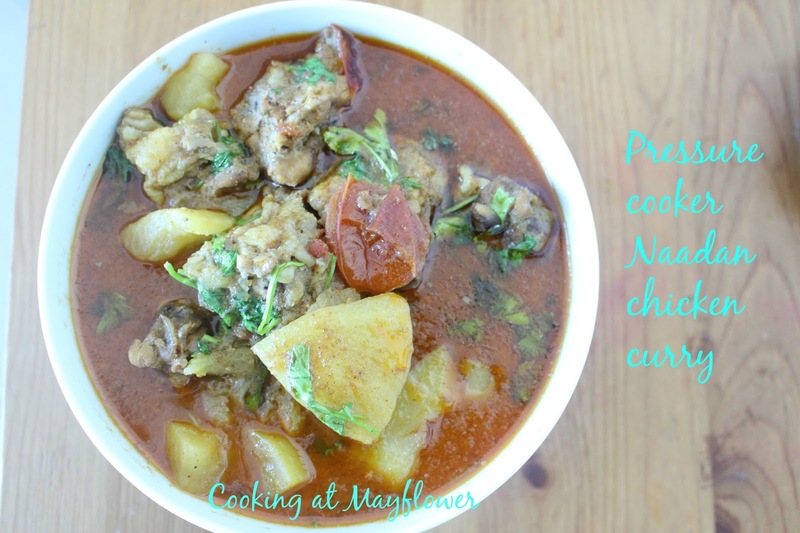 It makes a great curry for chapatis. Heat oil in a pan. Add onion and green chillies. Saute well. Now add ginger garlic paste. Saute in low flame. Add 3 tbsp of water. Add turmeric powder, coriander powder, and chili powder. Mix well for 1 minute. Add tomato paste. Allow it to cook. When the raw smell of tomato leaves, add water, mushrooms, peas, and salt. Cover and cook. When the mushrooms are cooked, add sugar. At last, add fresh cream and switch off the stove. Garnish with coriander leaves. Virgin kiwi mojito is a quick pick me up for lazy days. It will leave your kids asking for more. So always double the portion while making it. Muddle kiwi, mint leaves, lime juice and honey. Fill 1/4th of glass with ice cubes. Now pour club soda to top it. Garnish with kiwi slices, lemon slices or mint leaves as desired. Pooris are unleavened fried flat breads from India, which are enjoyed by young and old alike. Pooris are served with different kinds of potato curry and tea. Pooris are made from soft dough of wheat flour. It is then rolled and flattened to make pooris, which are then deep fried. Pooris paired with aloo bhaji makes a heavy and filling breakfast. In a bowl, add wheat flour, semolina, salt and oil. Mix well. Add water little by little and knead to make a soft dough. Cover with a wet cloth for 10 minutes. After 10 minutes, roll the dough into small balls. Using a rolling pin, flatten the balls to make 4-inch pooris. The pooris should not be too thick or thin. Heat oil in a deep pan or wok. When the oil is hot, add one poori at a time. Once the poori fluffs up, gently flip the poori on to the other side. When both sides are done and the pooris are golden brown in colour, remove the pooris on to a paper towel. Serve hot with Aloo bhaji or Potato carrot masala.